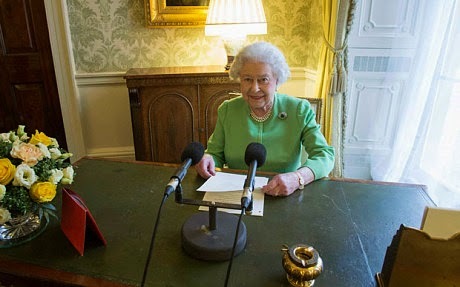 The Queen has hailed the continued role of the Commonwealth in today's world, saying what the member states share is more important now than at any point in its history. In her Commonwealth Day address, she said the 53 nations are "guardians of a precious flame" with an obligation to keep it burning brightly for decades to come. In a broadcast with the theme of A Young Commonwealth, Her Majesty warned that "when common goals fall apart, so does the exchange of ideas. And if people no longer trust or understand each other, the talking will soon stop too". "Not only are there tremendous rewards for this cooperation, but through dialogue we protect ourselves against the dangers that can so easily arise from a failure to talk or to see the other person's point of view," she added. "Indeed, it seems to me that now, in the second decade of the 21st century, what we share through being members of the Commonwealth is more important and worthy of protection than perhaps at any other time in the Commonwealth's existence. "We are guardians of a precious flame, and it is our duty not only to keep it burning brightly but to keep it replenished for the decades ahead."